Lenovo recently released the latest Lenovo Moto Smart Assistant for Lenovo and Moto Android smartphone users. Lenovo Smart Assistant is the latest tool to update your phone Firmware ROM and fix issues and errors of your mobile phone software within few seconds. Most Lenovo phones get their latest software updates directly to the phone. But in some cases, where you have issues with the stock firmware or are not able to download the OTA update on your phone. Then Lenovo Smart Assistant will help you to update the latest one. This latest Lenovo software tool comes Lenovo USB Driver. The software not only provides these drivers but also helps in updating your device to the latest available firmware. Now you can easily download Lenovo Smart Assistant at the given download link. 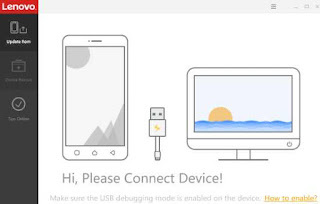 Connect device via USB cable or Wifi, and then manage Pictures, Videos, Music, Contacts, SMS, much more. Upgrade your phone or tablet device. Update device system software to the newest release even can rescue device from software caused un-operational status. Rescue your phone dead issues. Online tips for device update solutions. If you can download and install Lenovo smart assistant and require drivers on your PC windows. Then Lenovo Moto Smart Assistant will connect with your phone and help you to update ROM, and fix all issues of your phone. If your Lenovo phone is not working or the software has corrupted due to any reason of your phone device. Lenovo Smart Assistant latest version allows you to download and install the latest stock firmware for your phone depending on your phone model and region. In a way, it rescues your Lenovo phone with stock official software and gets your phone back in working condition. This Lenovo mobile assistant only available to Windows PC users. Lenovo Moto Smart Assistant support Windows XP, Windows 7, Windows 8 and Windows 10. So download and install latest Lenovo Moto Smart Assistant free download at the given download link. Just tap the link and your download start within seconds.